Tomatoes and basil are excellent to grow in an aquaponic system. 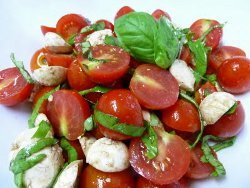 Here is a great Italian salad for your organic veggies. Mix bocconcini, tomatoes and basil together in serving dish. Dress with olive oil, balsamic vinegar, salt and pepper. Gently toss and serve.